Permaculture is about closing loops, removing waste from profligate systems and finding innovative ways to reuse things. We throw away lots of car tyres every year, so finding things to do with them must be good. One food-growing technique that seems to embody this principle of reusing waste is using old tyres as a container to grow potatoes and other vegetables in, but is it a good idea? Academic research into shredded tyres suggests that there may be a problem. 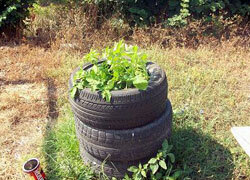 This article explores the practice of growing vegetables in used tyres. Why grow food with tyres? Growing with tyres is simple. 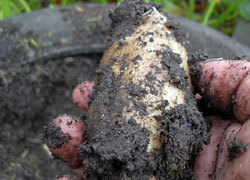 Place a tyre on a sheet of cardboard, put in a few chitted potatoes and cover with earth. When the plants grow high enough, add more earth and another tyre and so on, until you get a stack of tyres bursting with spuds. Harvest time is easy, just knock the tyres over and out roll the potatoes. Surely, it has to be up there with the effortless simplicity of no-dig gardening or the chicken tractor. Sounds brilliant, low input, high output, quick trip down Kwik Fit… but wait a minute. Under the recent EU Landfill Directive, tyres have been classified as hazardous waste, with a ban in the UK on whole tyres being sent to landfill. So is it a good idea to use tyres as containers to grow food in? Or are we simply looking at yet another case of bureaucracy gone mad? Or is there an underlying problem of toxicity, as the tyres slowly leach their contents into the soil and onto your plate? Tyres are extremely durable. During manufacture, natural rubber is combined with synthetic rubber and treated with a cocktail of chemicals, some toxic or known carcinogens, others more innocuous, to make the tyre withstand all the forces that will act upon it on the road. For a list of some of the chemicals involved and their known health impacts, see the Appendix. Each of these forces works in a different way on the tyre, but over time collude to break it back down into its constituent parts. During this process, the various chemicals and compounds are slowly released through off-gassing, particulate matter or ‘tyre dust’, or as chemicals, leaching out into water. As an aside, the Environment Agency [Great Britain. Environment Agency (1998) Tyres in the Environment. Environment Agency, Bristol ISBN 1873160755, p.43] calculates that every tyre loses 20% of its weight during its lifetime on the road, getting slowly ground down and blowing away in the wind. Most off-gassing occurs within the first year, for example, that ‘new carpet smell’, and given that tyres typically are 3 to 5 years old before being discarded, this would not really seem to be an issue. What should be of greater concern to growers, is the gradual erosion through water and sunlight, and any leachate of chemicals and toxins that may occur to contaminate the surrounding the soil and anything grown in it. The point is that if there is a source of pollution, then the important thing is to remove the risk by eliminating any pathway from it. In this case, placing potatoes and soil in a tyre and then watering it is not eliminating the pathway; it is exacerbating it by joining the dots so that toxins can flow freely from the tyres into plants and then build up in the food. The disintegration of tyres is well demonstrated when they are used to weigh down covering sheets in silage clamps. The tyres usually degrade to point where the steel belt starts coming out of the tyres after ten years. Yet the effects aren’t completely understood. A report by the Environment Agency states that “little is known about the long-term leaching of organic chemicals from tyres in landfill sites” [Environment Agency, p.27]. Like many types of rubbish we produce today, we don’t really know what the individual effects of the leaching chemicals are, let alone any synergistic impacts. However, there are strict controls in place for the proper disposal and handling of used tyres, and it is illegal to dump them, with large fines for fly–tipping – showing that problems with tyre disposal are appreciated. 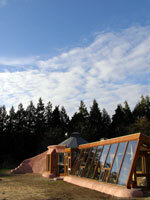 Last autumn, during a Self building an Earthship course, we poured out water that had been collecting in a tyre and compared it to unfiltered rainwater from our tanks. 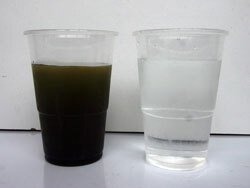 The accompanying photo shows that the tyre water doesn’t look so pleasant, being dark, with suspended solids in it, whilst the rainwater is clear. Which would you rather grow your food in – tyre-steeped water or just plain rainwater? 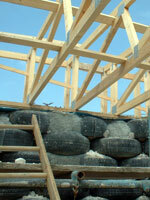 Whilst on the subject, an objection commonly raised about Earthships (a form of building that uses car tyres for building walls), is that tyres off-gas chemicals and these could be slowly poisoning people living in them. As outlined above, the solution is to isolate the tyres from anything that can degrade them, and remove pathways for contaminants. So if they’re used in a way that’s inert, e.g. damp-proofed and rendered to protect them from sunlight and water, they shouldn’t really a problem, although again further research is needed. Is growing food in tyres worth the risk? When it comes to growing food in tyres, why take the risk? Whilst the quantity of toxic chemicals maybe small, we don’t know the exact amount used in tyres because of commercial secrecy. People generally grow food organically for themselves to avoid exposure to synthetic chemicals. It seems ironic that a ‘Permaculture way’ of reusing tyres could be unintentionally reintroducing potentially harmful chemicals back into the equation. I’ve never met a potato I didn’t like, but maybe I’m about to. Mischa Hewitt is the author of Earthships in Europe and runs Self Building an Earthship training courses with Brighton Permaculture Trust at Earthship Brighton. 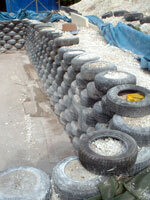 Brighton Permaculture Trust offers a course on practical permaculture gardening, where you won’t be gardening in tyres.